BluePoint Games has announced that the Game Update 2 for Titanfall is now live on Xbox 360. You can login and you’ll be prompted to download the new patch update. Localization Issues: Fixed several localization issues reported on the forums. For example the challenges Commuter Flight and Cowboy Up had the wrong plural tenses. Max XP: If a player reached the max XP level their XP would be reset. Most player saw this when reaching Gen 10 and their XP would be reset to 0. Other players reported that they would be disconnected from the server when this occurred. The XP is now properly clamped to avoid these issues. Satchel Server Disconnect: During the evacuation sequence if players attach satchel charges to the dropship and detonate them after the dropship has warped out, the server would crash causing all players to be disconnected. The crash issue has been fixed. Private Matches: Reduced the required number of players from 6 to 2 for private matches. Party Colors: Your party members and their titans now show up on the mini-map with green colors, instead of the normal blue colors that other friendlies use. Their names are also drawn in green on your HUD, the obituary text, and in the pregame lobby. This helps you figure out where your friends are and what they’re up to, especially in the heat of combat. Auto Titan Color in Obituary: Your auto Titan’s name now shows up in the obituary with the gold color that your own name does. Previously it had the same blue color as any other friendly. This makes it easier to keep tabs on how your titan is doing. Menu Changes: “Play Multiplayer” is now the default (top) option on the private lobby menu, if you’ve completed both the IMC and Militia campaigns. It has also been renamed from “Play Classic”, since the term “classic”, which we used internally, proved to be confusing once the game was released. Game Version on Main Menu: The main menu now displays the game’s version in the bottom left corner. Now you don’t have to wonder if you really do have the latest version of the game, and we can use that to double check things if we’re ever troubleshooting. • Fixed an issue where a Titan firing ordnance would not show on the mini-map correctly. • Fixed a rare bug with Pilot health pools that would make them virtually invincible. • Fixed a server crash that could occur at the end of a match. • Titan shields now protect friendly rodeo players from explosion damage (such as from an arc cannon). • Fix case where a pilot can embark a Titan through walls. • LMG and XO16 firing sounds will no longer sometimes cut off before the gun is finished firing. • ARCHER now locks onto the top of a heavy turret rather than the base. • ARCHER now homes in on the Titan correctly when targeting Titans that are kneeling. • Fixed shimmery shadows in a spot in Lagoon map. • Fix satchel charges and particle shields causing pilots to permanently rodeo other pilots. • Fix certain characters not rendering properly in French and other languages. • Fixed an issue where “Initializing…” would be displayed if a server wasn’t found. • Fixed being unable to scroll to the top of the datacenter list after scrolling down. • People who previously could not progress past the loading screen when connecting to servers should be able to play now. 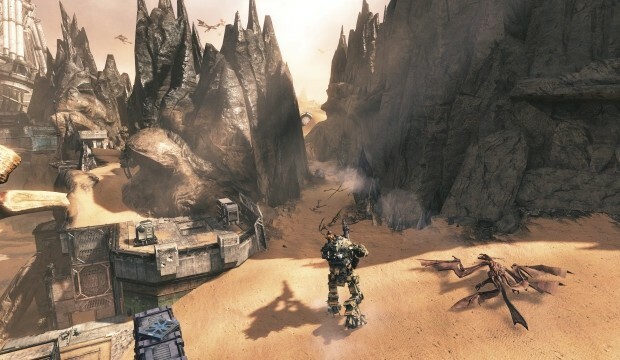 Still no news on when Expedition DLC or Game Update 3 will be available on Xbox 360; it’s expected in June.